In a recent report, Transparency Market Research (TMR) presents insights into the growth drivers and factors restraining the global platelet rich plasma market. According to the findings of the report, the global market for platelet rich plasma, which stood at US$0.16 billion in 2013, will reach an estimated valuation of US$0.35 billion by the end of 2020, rising at a healthy CAGR of 11.90% therein. The TMR report is titled “Platelet Rich Plasma Market - Global Industry Analysis, Size, Share, Growth, Trends & Forecast 2014 - 2020” and is available on the company website for sale. It states that growing awareness regarding platelet rich plasma (PRP) products and equipment, particularly in developing nations, is fuelling demand from the global platelets rich plasma market. Rising incidence of orthopedic diseases and sports injuries around the world fuels the demand from the platelet rich plasma market. Additionally, growing preference for cosmetic surgeries also acts as a catalyst for the overall demand for platelet rich plasma. In the last couple of years, the market has demonstrated significant growth due to the introduction of the latest technologies and quickened regulatory processes for new devices and equipment. However, on the flip side, the high cost of platelet rich plasma products and equipment and risk of therapy failure or transfer of disease (in some specific cases) are the factors inhibiting the growth of the market. Despite such hindrances, innovations in medical devices and the launch of novel applications of platelet rich plasma technology are anticipated to boost the growth prospects of the global platelet rich plasma market in forthcoming years. Among the key segments of the global platelet rich plasma market, the P-PRP segment accounted for 60% of the overall market in 2013. However, the report forecasts the L-PRP market segment to exhibit the fastest CAGR during the report’s forecast period. Based on origin, the autologous segment held the largest share in the global market for platelet rich plasma in 2013. However, due to the rising popularity of allogenic-blood-derived PRP products, the autologous PRP segment is likely to lose its market share in the near future. The allogenic segment will exhibit the fastest CAGR during the report’s forecast period. 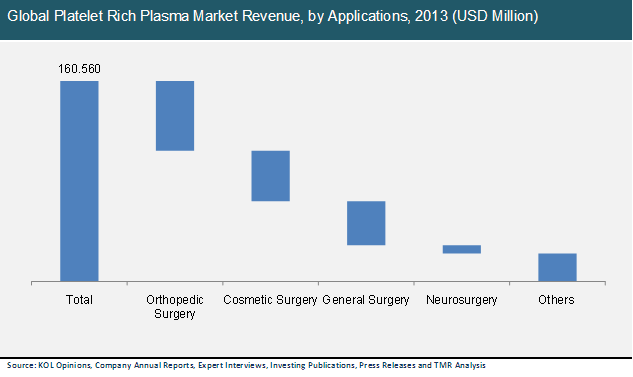 In terms of key applications, the orthopedic surgery segment held over 30% of the global platelet rich plasma market in 2013, emerging as the market leader. The easy access to PRP technologies and rising demand for cosmetic surgeries augment the use of PRP in orthopedic surgeries. Among the regional markets, North America dominated the global platelet rich plasma market in 2013, accounting for over 50% of the market. However, the market is expected to see robust growth in the Asia Pacific region, states the report. To study the vendor landscape, the report profiles some of the leading companies operating in the global platelet rich plasma market, such as Dr. PRP America LLC, Exactech, Inc., AdiStem Ltd., and Regen Lab SA.